Welcome Home! 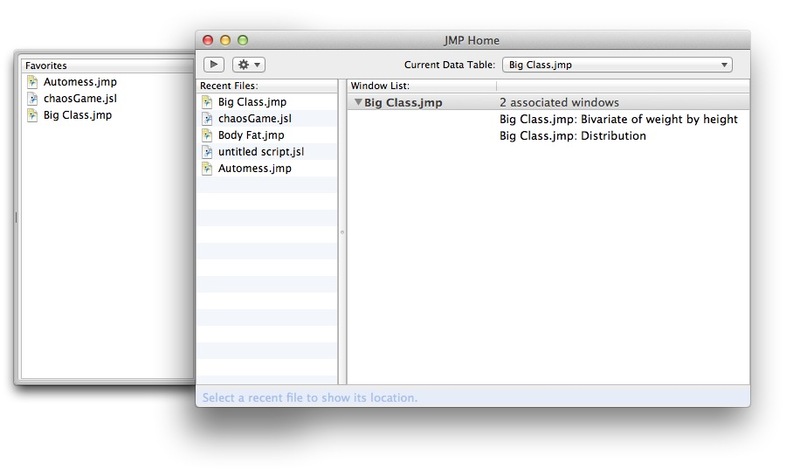 Let me introduce you to the JMP Home Window for Mac OS X. When development began on JMP 11, the Mac OS X host development team started the process of investigating differences between our platform and the JMP product on Windows. We wanted to begin bridging the gaps between the two products, while at the same time retain the great look and feel that Mac applications have. This is a first look at some of the new features in JMP on the Mac that begin to eliminate those differences. The JMP Home Window for Mac will automatically appear on start up with JMP 11. 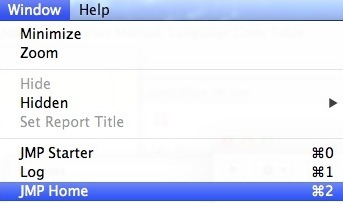 There is a check box to set the preference under the JMP Application Menu->Preferences->General (see Figure 1a). You can also start the home window manually via the Application Menu item Window->JMP Home (see Figure 1b). A hot-key combination of Command-2 will work as well. The new JMP Home Window on the Mac uses a rich, native user interface to present JMP practitioners a centralized environment from which to control and navigate a JMP session. Figure 2 shows the entire view presented to the user. Before we dive into the details, let's outline some of the controls and regions available. The left-most view is actually a “drawer” control that can be slid underneath the main window via a toggle button. In this drawer control (labeled “Favorites”), users can add frequently used files from their Recent Files list. This mirrors the act of pinning a file on the Windows home window. The Recent Files view is simply that – a list of files opened by JMP. The number of files in the list is determined by Mac OS X system settings. The right-most view contains a hierarchical representation of the windows currently opened by JMP. The collapsible node contains a data table and reports associated to that data table. Various controls also exist along the top of the main window – from left to right: a toggle button for showing/hiding the favorites drawer, a gear icon drop-down to clear the recent files list, and a drop-down to select and set the active data table in JMP. The Favorites drawer is activated by clicking the toggle button in the upper-left corner of the Home Window (refer back to Figure 2). Users can open favorites by double clicking the file. Hovering over the file name will display it's complete path. Items are removed from the favorites drawer via a context click/right click menu item “Remove from Favorites” (Figure 3). The recent files list allows users similar functionality as the favorites (double-click item to open) yet coordinates with Mac OS X to show files that JMP has opened previously. Items in this list can be saved to favorites with a context menu click “Add to Favorites.” The number of items in the list are controlled by the OS as well via a setting provided in the Mac system preferences (System Preferences->General->Recent Items). One item that will be useful to Mac users is a fully functional path control located in the bottom blue bar of the Home Window. This provides a navigable path to a selected item in the recent files list (see Figure 4) and allows single-click opening of folders or file shown along the path. So, if you know you have more JMP tables in a shared directory as one of your recently opened files, you can simply click on item and single-click its folder in from the path control! Perhaps the most useful feature in the Mac Home Window is the navigational session browser known as the Open Windows view. Labeled “Window List,” this view contains a hierarchical and collapsible list of open JMP windows in the currently active JMP session. As seen in Figure 2, a main node, or parent window (in this case our data table “Big Class”) is highlighted by a gray bar with a right-side notation indicating associated window count when applicable. If windows associated with the parent window are open, they are found under the main window. Figure 1 shows the children nested under our data table example, but they can be hidden as well by simply clicking the disclosure triangle next to the parent node (see Figure 5). The are two mouse button actions associated with the Window List view to aid in navigating a JMP session. A double click will invoke an action that brings the clicked item window to the foreground, while a single click or selection of an item will change the “Current Data Table” selection to correspond to the parent or child window's associated data. As with all of the Home Window views, the Window List has a context menu associated with it as well that triggers a close action (see Figure 6). If a user control/right-clicks a single item (or a parent with no associated windows), the window closes in JMP, assuming no changes to the file have happened since opening. However, if a user selects a “Close” action on a parent node, they receive the standard JMP dialog alerting them to associated windows being open in which they can take the appropriate action. More to come -- in part two I will discuss enhancements to the Home Window available in JMP 11.1, as well as touching on the “Combine Windows” dialog and the “Show Data Table” action.